UPDATE: Currently not building circuit boards, I can make the curved rods if I get enough orders. Maybe someone can retail them for me. Parts: I have 10-32 brass rods precision curved to a 7.14 inch radius. $20.00 cost includes USPS first class mail shipping in the US. Original stepper motor quartz timed driver board as used in my stepper motor platform is available for US$ 95.00 plus shipping Please inquire. I build boards with new components each month. Polar Alignment - 99% of all the detail there is on the subject. I'm offering some key Astrokit barn door components that others may find of interest for their own projects. I have the brass rods used in both style platforms. I've listed them on cloudynights.com classifieds under ATM parts. These rods are critical to a curved bolt barn door design. I developed a purpose built machine that does exactly what's needed. When I first researched how to curve rods back in 1986, advise was limited to bending rods around trees or the back of toilets. Believe me, the results were disappointing. In order to supply rods for my budding Astrokits business I needed to curve rods in a repeatable fashion. So I needed to design a machine that forms a true precision curve... not just a bend. Before that I learned there were no fully threaded accurately curved brass rods of any kind on the market. Machine shops told me they never make rods like this and didn't want to be bothered figuring it out...never mind my asking for a precise radius. I continue making these rods in-house as needed with no vendor supply issues. The straight rods are easy to get but I'm sure current prices would raise my cost if I were to run out of my stash of straight rods. BTW, are there machinists out there that have knowledge of a shop creating curved threaded brass rods now or in the past? When designing a high performance barn door platform, every element involved must be precise, not just the brass rod. Example, I had to go completely overboard and use an Astro-Physics polar finder to put an stop to endless polar alignment errors. A finder like this is a few hundred dollars. It is possible to use something like a rifle scope but you'll need a full understanding of exactly how Polaris moves around the North Celestial Pole (NCP). On the other end of the camera lens spectrum you don't even need a finder scope if your work is limited to using a standard 50mm lens for wide shots. With the first type Astokits, eyeballing along the thin edge of a plastic hinge was perfectly adequate since high precision was not the goal. The subject of polar alignment tends to be one of secondary interest. Believe me, as you advance in astrophotos, you'll realize you need to fully understand polar alignment. Thankfully, Marcus Wildi has done much research on how polar alignment affects modern systems. Find the time to study each page he has listed on the left side of his main page: http://one-arcsec.org/e/fram_e.html Hint: Tracking accuracy is just a starting point. I have about a hundred of the Airpax A82478-M1 stepper motors used on my larger platform. This is a really nice heady duty motor with built in gear reduction. It's amazing how little current is needed to run the platform and not cog or loose steps. See the datasheet PDF for the driver circuit and motor at the bottom of this page. I wish I had stock of the large brass gear you see in my videos and still images. I got them from Chicago Gear Works. It was their model A100 brass spur gear with a few modifications. I'm checking into sources of alternative modern gears. The good thing is there are countless other ways of doing the same thing my custom gear did. The idea is to find a way to rotate a gear or nut (with a #10-32 threaded hole) while resting on the lower platform. My gear was resting on a commonly available enclosed ball bearing (77R10). Turning the gear at one (1) RPM and ensuring it is centered exactly 7.14 inches from the hinge axis, will cause the 7.14 inch radius rod to move the upper platform at the celestial skies sidereal rate. The nice thing about all barn door designs is there is no concern about where the camera is pointing. The motor system only needs to keep the gear turning at one RPM. No other speed is necessary for the camera to follow any area of the sky. I'm putting aside things like atmospheric refraction and that fact that it's far easier to follow the polar regions than the equatorial regions. Many people ask about problems they are having with their camera lenses. Usually there is no problem, it's just a matter of understanding how a lens performs with celestial subjects. See this page which goes into detail on using camera lenses for astrophotography: http://randombio.com/astrophotography-without-a-telescope.html By T.J. Nelson. The driver board will be posted on Cloudynights shortly. See the PDF datasheet below it's picture further down. The price will be $95.00 plus shipping. I'll add a free A82478-M1 stepper motor and AA battery holder for a limited time. See more barn door pictures at my Flickr site HERE - I also have this page that describes the quartz/stepper platform. This is the original Astrokits brand quartz timed stepper motor driver board along with an Airpax A82478-M1 stepper motor and 4-AA battery pack. This set is currently available. All board components are new except for the board itself and the Saronix IC. The motor is never used new old stock. The battery pack is new. Every board is checked for frequency accuracy. See the PDF below for more information. How good is the Stepper accuracy? I test each driver board to verify the Saronix IC is within it's published rating which is 50ppm. This is typical for quartz crystals. I use a Fluke frequency counter. The numbers are almost always around 30ppm high at room temperature. I didn't make a complete temp/ppm curve but I've tested them at 0 degrees F and they run about -40ppm. It should be noted the accuracy needed for excellent guiding with a long 400mm lens for 15 minutes is about 500ppm. 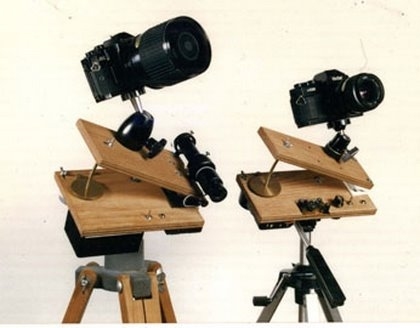 With a quartz/stepper system, motor speed becomes a non-issue, leaving you to tend to all the other factors involved with astrophotography; polar alignment, vibration, focus, mosquitoes etc.